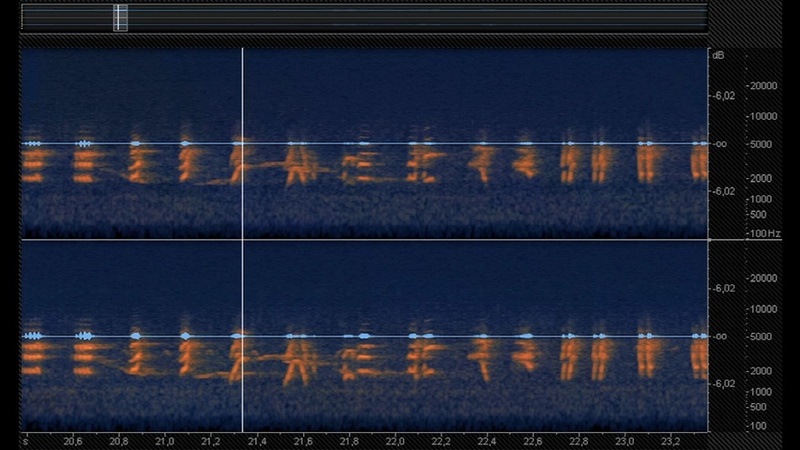 Spectrogram of reed warbler song(= Mastersingers, Reed warbler). Sv: Rörsångare. Hålanda, Sweden, 9 PM, 8 June 2014. A common blackbird (koltrast) is also heard. Telinga LX002 parabole with stereo DAT mic, recorded on Zoom H2. Sonogram from Izotope RX2 v. 2.10, screen capture with Debut v. 1.83. The recording consists of three merged clips and is non-optimal due to traffic noise that motivated substantial noise filtering. But the spectrographic contours that look like Chinese signs are beautiful, don't you agree?